This is the perfect app for every Sailor out there that needs to know what they need to score for their PRT. Do you ever get to the day of the PRT and forget what the ranges are? If you have you phone you will have it at your finger tips with this app. I have had the app for a while now and a new update came out and I failed to notice a mistake I was making I e-mailed the contact and had a response with in a day. They were extremely helpful. This is a must for your Sailor Career toolbox! The upgrade to the app is amazing. It is a lot easier to navigate and use. I've been using it for years. And I was having a lot of problems with the machine trainer, until I read the description. Most people who already have it might not. Otherwise, you should get this, it's worth it. The new update is having issues with staying loaded. I can no longer calculate my bike score as well. I have been using it for the last few years to estimate my PRT score. Interface has changed though. For instance, to access the alternate cardio events you now need to select the "Run" category under the PRT Calculator. It then expands to allow you to select swim, bike, and elliptical options. Have used this app for years and have loved it. Busted it out for this season's prt, and my numbers are completely off. 30-34 male numbers don't seem to be the same as the official navy numbers. Not sure if this is user error, or it there is a glitch. I can't put run times in. It's stuck on the weight and won't let you scroll through run times. Needs an update. It does not show anything on biking the prt!! The PRT calculator is all wrong! It tells me in one portion the score for good but in the calculator told me it would be a fail?!?! Used to work just fine. Put it back the way it was! 3.0 update is very disappointing. The interface is worthless. Go back to the old version. I really like this app. It would be nice if you could save your data to show progress. Can you please update this app with the new instructions. The PRIMS has a great application to track progress but you don't have it in a handy app that you can use anywhere. This could be a great app if is updated regularly. Thank you! I have he latest update while a friend has 3.0 and they variables in the PRT calculator are way off. 3.0 matches the instruction while 3.0.1 doesn't. 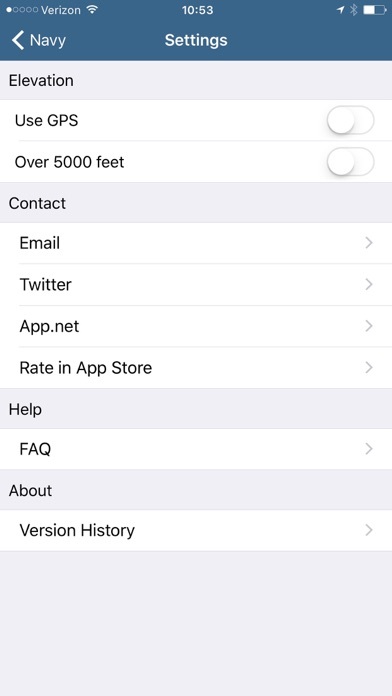 I'm over 5K feet and every time I click that setting it won't accurately reflect that change. Unreliable for now until this update is fixed. The information on this app is public knowledge. And I paid for expecting more. I too recommend check PRIMS website for correct calculations for age vs machine times. Since last update you can not put in a run time under the prt calculator portion. Just shows weight selection the entire time. 11MAY2016 issue still has not been fixed. Still can not put in a run time using the calculator, just shows a weight input. Waste of 2 dollars. Free ones do the same. Please add bike and elliptical. Is it the cleanest interface? Meh. Does it do what it says it does? ABSOLUTELY! Thanks for the update!! This app works very well, but lacks straight forward directions. 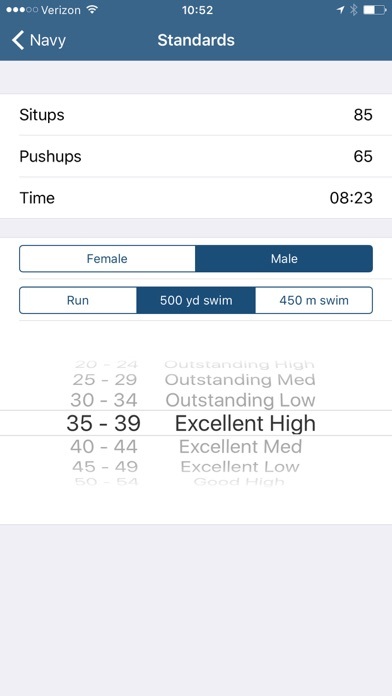 All calculators (run, bike, swim, elip) are located within the app; however, you physically have to tap the word "run" on the original calculator in order to bring up the other calculator options. I couldn't find any directions that explained how to do this. I just went tap crazy and figured it out. Make the user interface a little more intuitive, and you've got a 5 star app. I use it almost everyday to do my job! Easy to use and accurate! Would have loved this app. It's sad that I paid for it and still not enjoying it. Every time that I try to click on Prt Calculator tab, d app crashes. Not enjoying the app despite the fact that I paid for it .I don't usually pay for apps but for this app I did, hoping it will be worth it . I have used this app for the past 4 PRT cycles and I have used it religiously. I will say however it is not matching up to the current PFA Instruction OPNAVINST 6110.1 for male or female PRT Calculator. I noticed it was off and now because I found one mistake I can’t trust it. For example, I’m 31 so under the appropriate age group my max run for a good is 1345 but according to the app it’s 1100. The sit-ups and push ups are off too. Please update this app to match the most current instruction. I really loved this app and used it regularly. I would like to be able to trust it again. Thank you. Doesn't work! I want my money back! Give me a refund! I am having the same problem. Calculator worked fine until I tried to screen shot results as every time my phone would go to hibernate I would have to reenter all the data and wanted goal scores readily available. Now every time I go to calculate it dumps me back to my phone's home page. 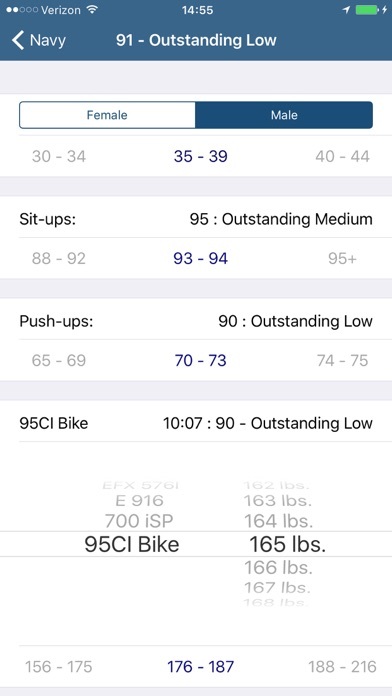 Just used this app for my bike PFA and it worked like a charm! Easy to use on my 5C and user friendly. No need to search all over for the right spreadsheet! Well worth the $2!! 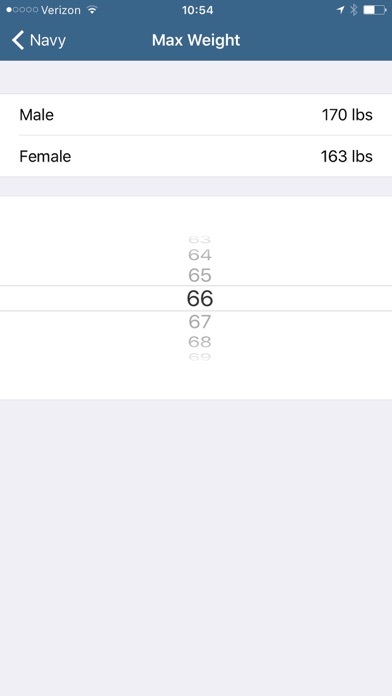 Not sure what happened to the cardio portion but it won't allow me to change the levels for the score. Swim, Bike and elliptical not working. As mentioned above, this worked on my iPhone 5 but tried to use on my 6+ and it is not working. I know it's under my run button but when I click run. it attempts to open up and immediately closes. I've reinstalled multiple times to no avail. Please fix as this helped a lot. I'll change this review when fixed. I've been using this app for a few years now and it has always been accurate and reliable. The fact that it has the machines in it is awesome. I'm do the bike! Once I take it out my partner for the exercises always wants me to look up their scores! I get outstanding every time now because I know what my goals are! Thank you for making this app so user friendly and accurate! I use this app a lot. I've never had problems with it crashing. Super handy to use, especially when people need to know the minimums on PRT day. I love the calculator function - much easier than doing it yourself. I did like the older interface better. The scrolling is a pain to me. 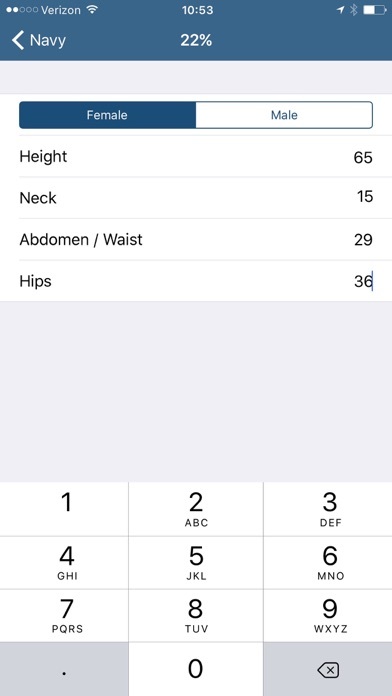 Just downloaded this app to calculate my results and when I went to put in my alternate cardio info it is just stuck with the weight. Waste of money if all this is good for checking the push up/sit up table I would of printed it and saved the money. Will not calculate bike, will not stay open. Horrible app! Don't waste your money!! This app is inaccurate and useless. Don't waste your money. All of the scores are wrong! Either that or my 42 year old body needs to be able to pass the SPECWAR test to get a SAT in the PFA. It worked great for a while, but ever since the beginning of 2017, whenever I go to the alt cardio calculator it goes to black screen and sends me back to my phone's home page. Considering I PAID for this app, this is unacceptable. Please fix ASAP. Where is the bike/eleptical calculator? I just bought this and there is NO bike/eleptical machine calculator as mentioned on the description and even shown on the picture. I will call this scam if this is not fix and want my money back. Please help and FIX!!! It worked before and it was great. Now it just crashes when I used the calculator. Missing other forms of cardio! I would give 5 stars if it wasn't missing the other forms of cardio that are available. Great app but whatever has been done to improve it is now making it crash. It worked fine before the update. I purchased this app a while ago, and it was correct when I downloaded it. However, now it appears the values are incorrect. For example: the minimum number of push ups, sit ups, and run time for each age group to get S/G/E/O/Max is completely off at least for females (I don't know about for males). I find the machine calculator was correct in previous versions, just be aware of these issues. As always, double check scores in PRIMS. It is a good app overall, they just need to fix these problems. Does not have a area in the app for it. App was great but in recent times has really fallen off with no update especially with all the PFA changes! Add all navy standard cardio options for CFLs doing their job out and about! Please this app used to be great but is really lacking now. The calculator isn't correct for at least the 40-44 age group. Consistently keeps up with PFA changes.